Ray founded Mitchell Restaurant Information in 1983 using a simple mantra: "Keep it simple. Keep it simple. Keep it simple." A mantra learned years ago while working in the accounting department of a large Oregon-based restaurant franchiser. In addition to his accounting and management responsibilities at MRI he is involved in overseeing the company’s growth and profitability. New technology and accounting practices are a part of his ongoing development of the company. 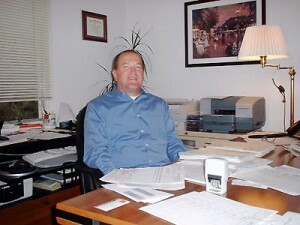 Prior to starting MRI, Ray was accounting manager at Taco Time International, Inc. in Eugene, OR. Ray is a graduate of Lebanon Valley College in Annville, PA.
Greg Nelson has been working in sales related business for over 15 years and brings a wealth of diverse experience to Mitchell Restaurant Information (MRI) and its clients. Greg’s primary role has been to concentrate on sales and marketing of the services MRI provides which covers a broad range of disciplines from print advertising to interactive branding. "Our business is very people oriented and as such, I am out there meeting our clients face to face, engaging them and assisting them with their specific needs", says Greg. MRI has been a profitable company for 21 years. Though its primary clientele is based in the Pacific Northwest, the goals moving forward are to branch out to other areas of the country and provide the successful services MRI has been providing to it’s Northwest clients.